Just a reminder for our readers in the UK that the ring promo started on 1 May and will run through the end of the month; the promo is buy 2 rings, get 1 free. In other great news, Germany will be getting the same promo starting 14 May until 3 June! I’m not sure if this is Germany only or if other European countries will also be having the ring promo. If you remember, we had this promo in the US during January and I got a few stacking rings which I have been enjoying very much. When I first saw pictures of the birthstone rings I wasn’t very impressed with their simple styling. 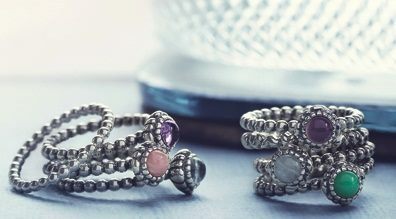 But the more pictures I see of ladies’ birthstone ring stack, the more I like it! At $45 per ring, I might have to get a few of these…stay tuned!